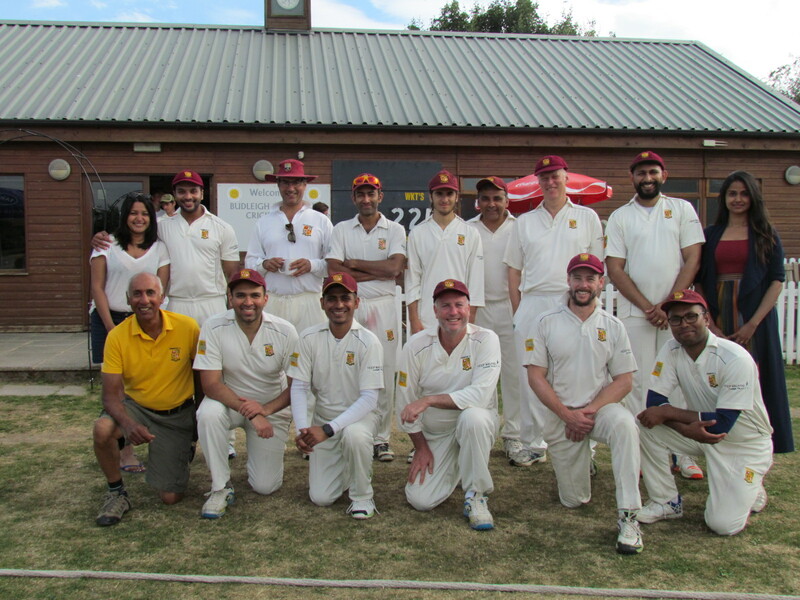 Back: Sam, Seethal, John, Rohan, Stefanos, Neeraj, Chris, Eddy, Alisha. After the success of the inaugural 2017 Devon Tour, there was little doubt the KCC contingent would again be travelling to the south west for a touch of midweek cricket. The 2017 KCC rural base of East Budleigh was exchanged for the seaside charm of Torquay. The self-professed centre of the ‘English Riviera’ seemed a remarkably apt description as the unexpectant UK heatwave continued. The first tour game was an evening 20/20 against an expectantly strong Exmouth side, one of the leading teams of the Devon Premier League. Jamie attempted a late WhatsApp exit stage left as the lunchtime beers had gone down a little too well, but eventually was wooed back into the fore by the unmistakable smell of sweaty wicketkeeping pads. With the home side down on numbers at the prescribed start time, we played the generous guests in allowing them to set us a score. We did a good job of containing what was obviously a very classy batting line up. Wickets fell regularly as they tend to do in the shorter format, but each incoming batsman looked pretty much the same as the last meaning we had to be at our best to keep the runs in check. George Greenway and Benny Rudolf lead the run scorers for Exmouth, with Neeraj and Alex Sabelli each collecting 2 wickets. All in all 159 was a very gettable total. KCC lead off with Tim and Kamrul and could not have asked for a better start, with Tim crushing a pair of fours and sixes, and Kamrul following suit. At 61 for 1 off 6 overs it was little more than a run-a-ball from then on. But cricket can turn quickly and in a matter of overs the wheels had well and truly come off the chase. 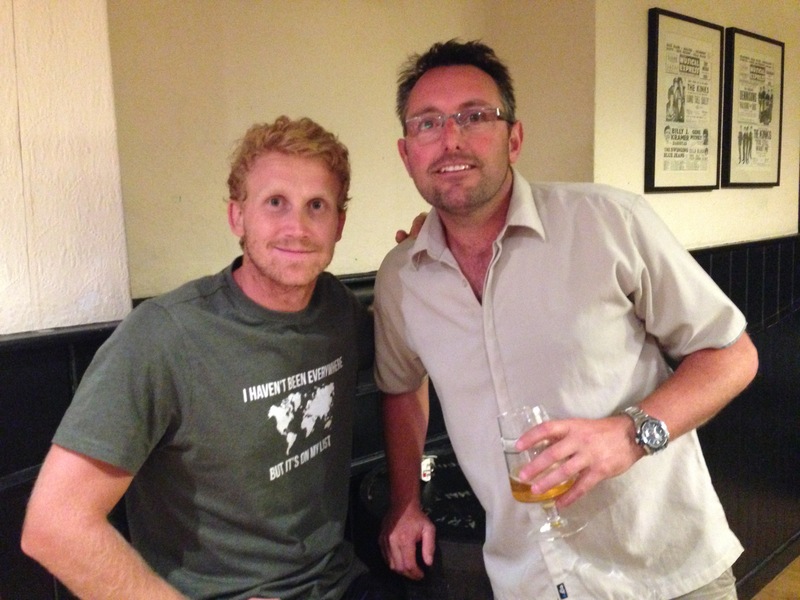 Exmouth choosing spin over pace proved to be the masterstroke as the KCC middle order came and went. Saikat provided some resistance to give us a faint chance, but eventually we fell 20 runs short in the penultimate over. The undoubted fixture highlight of the 2017 tour, we were thankfully invited back to Sidmouth for a return fixture. Jamie doubled down on the previous day’s attempt to avoid playing, this time boldly attempting to pull out just 30 minutes before the start time even though he was supposed to be skipper. Neeraj stepped in as he often does, doing the right thing in having us bat first on a lovely track. It could be said that Ravi Mantha rolled back the years opening the batting, but in truth I doubt we have ever seen Ravi bat with such calm authority. Lofted drives flowed effortlessly to the boundary as he and Rohan set up the KCC innings. Stefanos was also at his elegant best, and with Saikat providing the power hitting in the latter overs we reached an excellent score of 261. The Sidmouth response though was emphatic. Ed Hurley, who had apparently been out of touch and down the batting order in the league, blasted the ball to all parts from the start. We had nowhere to hide as he, and whoever was his batting partner, went full throttle without ever thinking about applying the brakes. Eventually we could wave the white flag as Sidmouth chased down our score in just 26 overs, Hurley finishing on an unbeaten 152. A humbling defeat, which was thankfully tempered as the entire travelling party of 18 retired to a nearby pizza bar by the sea, with a perfect view of John Behar taking an evening dip in the ocean. The final game of the tour, and easily the most exciting of the 3 fixtures, with the match going down to the final over. Neeraj got his wish to open the batting alongside Tim, but perhaps had wished that the young Budleigh left arm paceman had been left out of the side. He had apparently warmed up in the morning by bowling to a selection of the Somerset first team before switching his attention to the mighty KCC! With scoring hard to come by at his end, Tim and Neej pushed for runs at the other end and were able to keep the run rate at a respectable level. Elder statesmen Ledger and Behar were also pushed up the order and looked in great touch once the openers departed, Ledger square-cutting the ball from leg stump as he has always done with aplomb, and John gracefully stroking the ball through the cover region. A well-rested Jamie put the cherry on the cake, taking 20 from the final over to set up an enthralling chase for the home team. 226 required from 35 overs. A majority of the Budleigh Salterton line up were talented youngsters, and to a man were punishing of any loose bowling. Thankfully our bowlers were largely up to the task, especially Rohan whose controlled away swing led to measly figures of 3 for 21 from his 7 overs. No mean feat against a host of quality batsmen. Some slower bowling options would have been nice, but John felt a tweak in his neck whereby his allotted 5 over rest turned into the beach swim-shower-pint treble and he was not seen in his whites again. At the pointy end of the innings, the Budleigh batsmen began to open their shoulders with more regular boundaries bringing them closer to victory. Eddy, attempting a world first ‘low sugar diet whilst on tour’, returned at the death with more balanced blood sugar levels after an emergency prescription of Devon’s finest ice cream. Unfortunately, it wasn’t enough as Budleigh scraped home with 5 balls to spare. Tim: Overseas tours have always been a key part of the KCC social fabric, part of what we think makes us the club that we are. Sadly in recent years, with families growing, hairlines and bank balances receding and/or greying, such tours have been lacking from the KCC calendar. Hence the idea for a mid-Summer UK tour was born, where commitment months in advance was not required. With the help from some friends at East Horsley, Devon was the chosen destination. 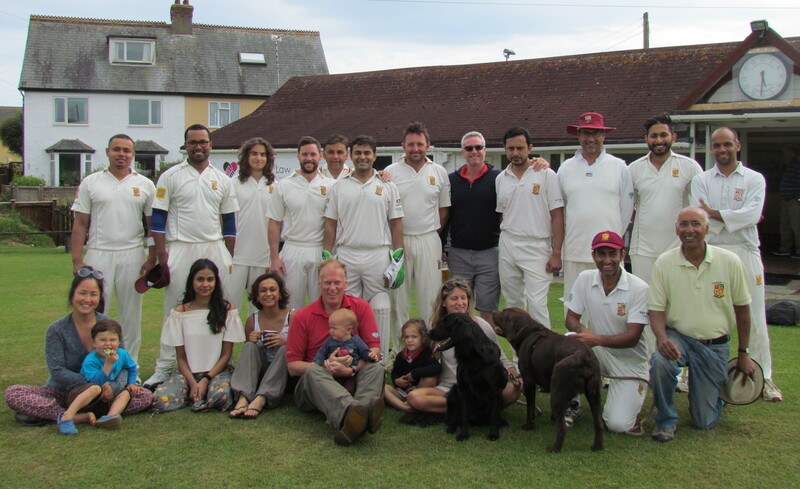 The response from the KCC entourage was strong – 16 playing members, 4 partners, 3 children, 2 dogs and 1 Recreational Vehicle – made their way to the sunny-ish English seaside for a spot of mid-week cricket. Home base was set up through AirBnb by Tim at Spring Cottage in the wilderness of East Budleigh, and it must be said that the accommodation was nothing short of superb. Tons of room for the bulk of the travelling party plus Todd’s sizeable RV, plus a large fridge to keep our cobras ice cold. San: Devon is a long way from London, made longer by a traffic jam on the M5. The result was that several of our players arrived at Ottermouth late for the 2 pm start. We were told that every winter the river floods the ground and pavilion. There was dampness in the air and the forecast suggested rain to follow, so the skippers agreed a reduced game of 25 overs. Jamie duly lost the toss and led KCC onto the field. Budleigh started well despite a probing spell from Eddy and Saikat, but it was first change Rohan who made the breakthrough in his first over. Next over, Eddy pegged back the other opener’s off stump. Todd Cornehls and John Behar followed suit with a wicket each as Budleigh slipped to 70/4 in the 12th over. We were not in the driving seat for long though as J.Doble and J.England hammered our attack to put on 108 runs and set us a target of 179. Mark Oppe kept wicket immaculately throughout. Jamie began briskly but was smartly caught in the 4th over. Ravi Mantha swung his bat but San could only scratch around, soon being clean bowled by Matt Junk who also did the same to Ravi. San announced his retirement soon after, citing failing eyesight, rejected by a hastily convened Committee meeting. Chris and Rohan could not accelerate and lost their wickets to Ed Middleton, leaving KCC with the daunting task of hitting 104 runs in 10 overs and the weather closing in. Saikat and Regan gave us a fleeting hope as they put on 33 in 25 balls. Regan’s run out however proved fatal to the cause and the asking rate spiralled out of control. The Mighty (Sar)War at least struck two mighty fours before we slid to the inevitable defeat, just as the rain set in. The tea was truly scrumptious and our hosts were excellent company. A very picturesque spot to play and we hope to revisit soon – when the weather is drier! Tim: The middle fixture was played at Seaton CC, an evening 20/20 which gave some of the members respite from the obligatory first night hangovers. The stumps were laid out when we arrived, but the green pitch on offer was not exactly to the batsmen’s liking. Seaton batted first, and one man who did like the look of the pitch was Toddy. He clean bowled the opening batsman and looked dangerous from the off. The Seaton middle order, however, showed their local knowledge, especially Brian Cann who hit a destructive 59 to lay the platform for a respectable score of 150. In response, KCC showed glimpses of their batting class, especially the promoted Saikat Barua who got 37, and with 4 overs remaining we required 37 off 4 overs and with 4 wickets in the shed, very gettable in the modern game. However, the Devon drizzle had by now truly set in and the fielding side bravely continued through it soaking wet to ensure a completion. It came sooner than anyone thought – 6 deliveries later and we were all out for a tame 119. Certainly not our best performance, and it left us 0-2 for the tour. Onto Sidmouth where we would be desperate to atone. Chris: Our final game of the tour at Sidmouth was a cracking 40 overs match in a spectacular setting overlooking the sea. 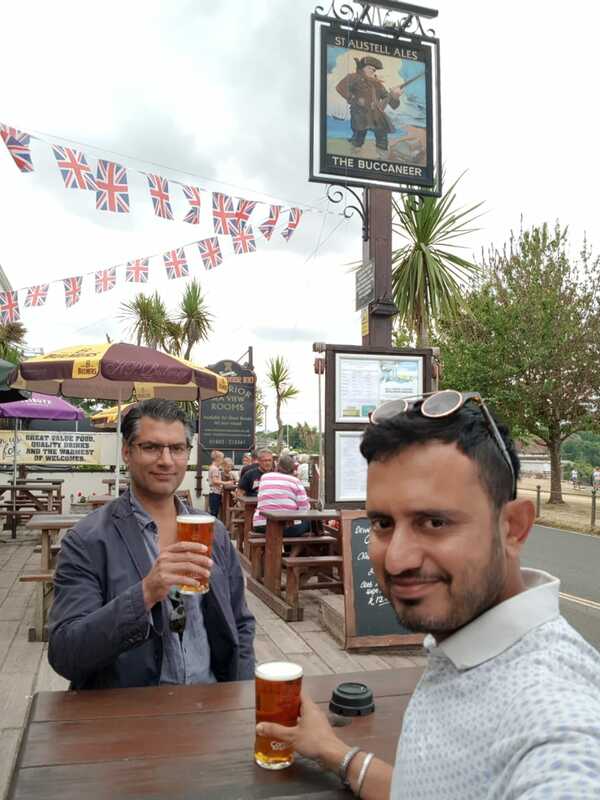 Sidmouth are one of the South West’s best cricket clubs, and as they told us they had an especially strong side, we let them bat first after an agreed toss, in order to avoid us being rolled over too easily in the first innings and the day being spoiled. Happily things didn’t work out like that at all. Sidmouth’s top order played handsomely, and in particular opener Sapiecho looked a class act, a 1st XI league player hoping for some good practice and expecting to score a big hundred. At drinks after 20 overs, with Sidmouth coasting along at 142 for 1, things looked very ominous indeed, with a score well in excess of 300 looking a virtual certainty. Neeraj, however, who often bowls at his miserly best against high class opposition, transformed the match after drinks by dramatically slowing the run rate, provoking the frustrated Sapiecho to try to attack a ball he should have defended, getting out LBW. Overall, KCC’s bowling and fielding in the last 20 overs was then exemplary, restricting Sidmouth to a gettable total of 248 – at least 50 or even 75 runs short of the huge score that looked on the cards after 20 overs. In reply, KCC stumbled badly early on, and we looked in big trouble by the time our best batsman Tim Keleher was dismissed with our score just 59 for 3. But brother Jamie Keleher and skipper Chris Ledger fought tooth and nail, putting on a big 130 run partnership to turn the match around. Jamie peppered the short leg side boundary and provided the champagne moment when a big six noisily smashed an unfortunate neighbour’s greenhouse. After Jamie was out, Chris shepherded us all the way to within sight of the winning total, before getting out in the last over with just 3 runs still to score. Well-earned victory came off the last ball – a great way to end the tour.